CD83, or HB15 molecule, is a 43 kDa glycoprotein member of the immunoglobulin superfamily. It is composed of a single extracellular V-type Ig-like domain, a transmembrane region and a 40 amino acid cytoplasmic domain. CD83 is predominantly expressed by dendritic lineage cells including Langerhans cells, skin and peripheral blood dendritic cells. It is also expressed by interdigitating reticulum cells present in the T cell zones of lymphoid organs as well as being weakly expressed by some germinal center lymphocytes. 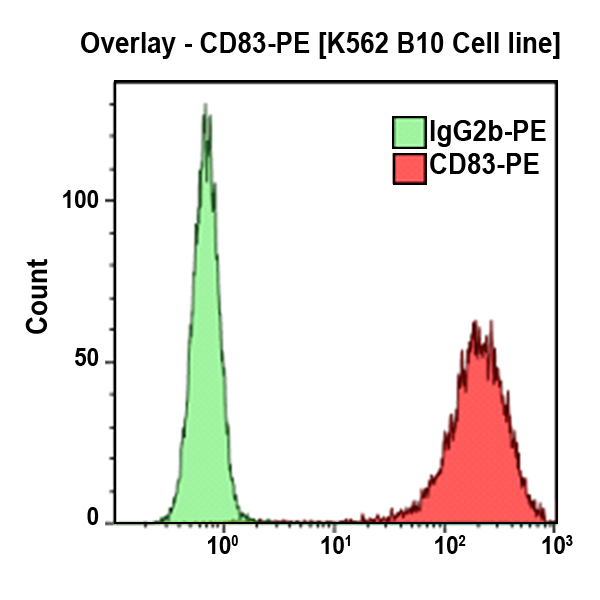 CD83 is expressed by in vitro generated dendritic cells. It is not expressed by resting peripheral blood leucocytes at detectable levels and is only expressed at low levels following lymphocyte activation in vitro.